Seventy-nine years ago a Jewish woman named Lilly Cassirer surrendered her family’s priceless Camille Pissarro painting to the Nazis in exchange for safe passage out of Nazi Germany during the Holocaust. On Tuesday her great-grandson was in a U.S. courtroom for the latest round of what has been a nearly 20-year battle to get it back. After years of appeals by both Lilly Cassirer’s descendants and Spain’s Thyssen-Bornemisza museum, where the painting has hung for 25 years, a trial to decide its rightful owner is scheduled before U.S. District Judge John F. Walter. Neither side disputes that Cassirer handed the painting over to the Nazis in 1939 in exchange for safe passage out of the country for herself, her husband and her grandson. But the Madrid museum has argued that she forfeited her ownership rights when she accepted $13,000 from Germany in 1958, after the German government concluded the painting was lost forever. The museum also has argued that it acquired the work in good faith and has never tried to hide it. Cassirer’s attorney, David Boies, grilled defense witnesses while seeking to show that the museum should have known it was looted art. Boies asked the museum’s legal and research team why they overlooked signs that indicated the provenance was questionable. One of the museum’s experts, Lynn Nicholas, said she couldn’t say if Baron Hans-Heinrich Thyssen-Bornemisza even looked at the back of the painting to study the provenance when he acquired it in 1976. Nicholas said she couldn’t explain why cardboard covering various labels showing provenance had been attached to the back of the artwork. One of those labels showed it had belonged to a Berlin gallery owned by the Cassirer family. “There’s no dispute about the painting’s complete history. The court examined all the evidence and determined that the museum is the rightful owner,” Thyssen-Bornemisza’s U.S. attorney, Thaddeus J. Stauber, told The Associated Press in 2016 after Walter initially dismissed the case. The Cassirer family successfully appealed last year and their lawsuit was returned to Walter for trial. The family’s attorney, David Boies, says the matter now boils down to Spain doing what’s right and surrendering the painting. 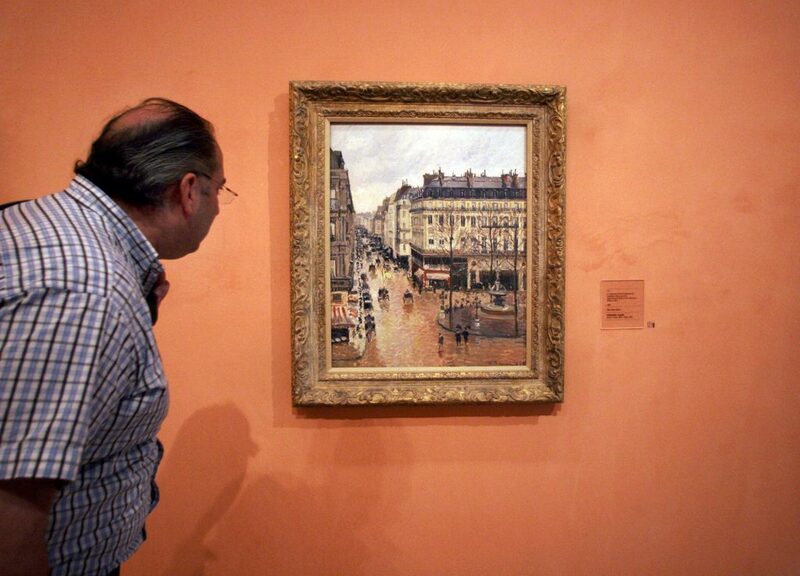 The painting, “Rue St.-Honore, Après-midi, Effet de Pluie” has been valued at $30 million or more. Lilly Cassirer’s father-in-law bought it directly from Pissarro’s art dealer and left it to her and her husband when he died. For more than 70 years her family believed it was lost. Then, in 1999, a friend of Cassirer’s grandson, Claude, who had fled Germany with her, saw a photo of it in a catalog and contacted him. “And he was completely stunned because we thought the painting was gone,” Claude Cassirer’s son, David Cassirer of San Diego, told The Associated Press in 2016. It turned out the work had been sold and resold several times before Thyssen-Bornemisza, one of the 20th century’s most prominent art collectors, bought it from New York gallery owner Stephen Hahn. Thyssen-Bornemisza, who died in 2002, sold the painting and hundreds of other works to Spain in 1993 and they now form the core of the museum named for him.